The presentation of this easy, offbeat soup, filled with spiced beans and grain (quinoa or bulgur) is like a taco turned inside out, is fun and dramatic. It’s perfect for a chilly weeknight meal, served with a colorful salad and a green veggie. Adapted from Vegan Soups and Hearty Stews for All Seasons. Photo by Theresa Raffetto. The presentation of this easy, offbeat soup, filled with spiced beans and grain (quinoa or bulgur) is like a taco turned inside out, is fun and dramatic. Bring 1 cup of water to a boil in a small saucepan. Add the grain of choice and simmer, covered, for 15 minutes, or until the water is absorbed. Heat the oil in a soup pot. Add the onion and sauté over medium heat until translucent. Add the garlic and bell pepper and continue to sauté, stirring frequently, until all are golden. Add the remaining ingredients, except the garnishes, plus the cooked grain and 3 cups water. Bring to a rapid simmer, then lower the heat. Cover and simmer gently for 10 to 15 minutes, then remove from the heat. This should have the texture of a thick chili, but if too thick, stir it a little more water. Assemble each serving as follows: Fill each bowl about ⅔ full with soup. Top with some grated cheese, shredded lettuce, and diced tomatoes. 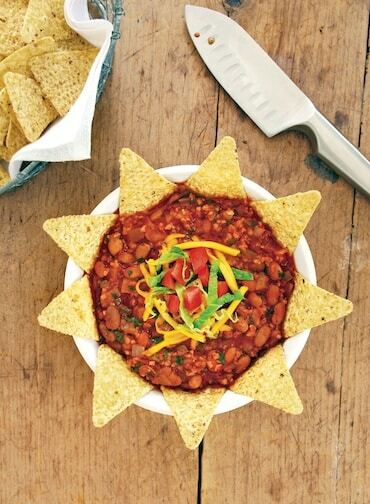 Line the perimeter of each bowl with several tortilla chips, points facing upward, for a kind of star-shaped effect. The tortilla chips can be used to scoop up the solid parts of the soup or just nibbled along with the soup. 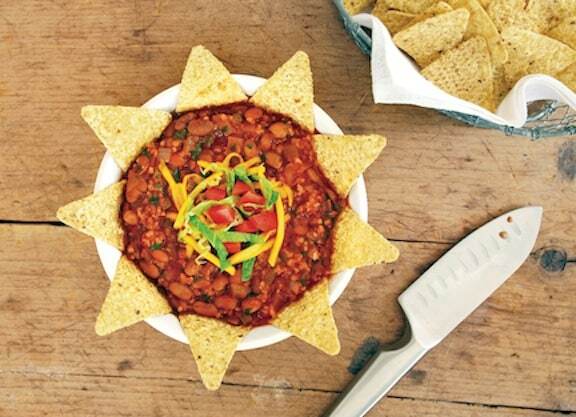 Pass around a bowl of extra tortilla chips and hot seasoning for embellishing individual portions. Hello — you can definitely use fresh tomatoes, and they need not be skinned or seeded. I just made the Taco soup! It is delicious! I had some left over cherry tomatoes and added it instead of a second can of crushed tomatoes. Also instead of plain can of pinto beans I have used Worthington Chili beans. So glad you enjoyed this, Ella! And as I always say, a good recipe is one that you can alter, and it will still come out well. I love to hear about reader’s tweaks and changes. I’m making this right now! I can’t wait to eat, it smells very good!! Sue, I’m so sorry, your comment somehow went under my radar. And after all that, I’m afraid I can’t help you on the calorie count!